News: Willy Wonka's glass elevator moves one step closer to reality with this new design for lifts that can move horizontally as well as vertically, and which promise to never make you wait longer than 30 seconds. 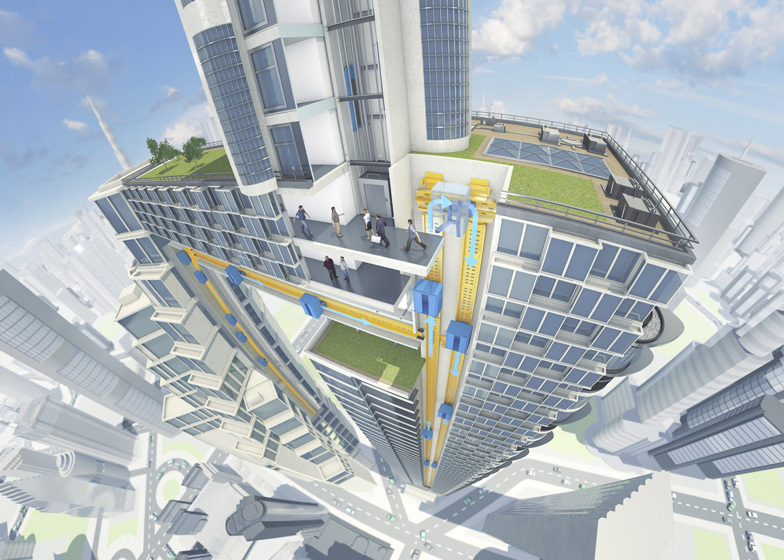 German company ThyssenKrupp has branded cable-hoisted elevators as a thing of the past, and has launched its design for a system of compact elevators controlled by powerful magnets. Doing away with the traditional rope and counterweight – a system that has been used ever since the birth of "the Teagle" lift in 1835 – ThyssenKrupp's Multi system would allow for several cabins in one shaft. If the technology becomes adopted by the industry, it would allow architects more freedom to design buildings with unconventional and outrageous shapes by doing away with the need for an elevator core. Every self-propelled cabin would be able to travel up-and-down or side-to-side, but each one would be part of a loop. This allows shafts to be half the size, but to still accommodate twice as many passengers. While traditional lift shafts have height limits, meaning they have to be staggered to service very tall buildings, specifications for rope-free systems wouldn't be constrained by building height. Combined with the increased capacity of multiple units in one system, this could give developers up to 40 per cent more useable floor space in high rises, according to the company. ThyssenKrupp said that a lift, travelling at five metres-per-second, would always be less than a minute away. "As the nature of building constructions evolve, it is also necessary to adapt elevator systems to better suit the requirements of buildings and high volumes of passengers," said Andreas Schierenbeck, chief executive of ThyssenKrupp Elevator. "From the one-dimensional vertical arrangement to a two-dimensional horizontal/vertical arrangement with more than one or two cabins operating in each shaft, Multi represents a proud moment in ThyssenKrupp's history." The design employs a magnetic system known as linear motor technology, which was first invented for use on Transrapid, the German high-speed monorail train that works by magnetic levitation. One motor would drive both horizontal and vertical movements, and the cabins could be stopped using "a multi-level brake system". ThyssenKrupp, which is also one of the world's largest steel producers, compares the current industry-standard elevator system to building a railway line between two cities and using it to operate just one train. "Per year, New York City office workers spend a cumulative amount of 16.6 years waiting for elevators, and 5.9 years in the elevators. This data provides how imperative it is to increase the availability of elevators," said Schierenbeck. The company plans to trial the first unit in 2016 on a test tower in Rottweil, Germany. Although it claims to have launched "the world's first rope-free elevator system", another design for cable-less lifts has been patented by American firm MagneMotion.